A hot tub sanitizer can come in a few different forms but the bottom line is they are necessary to keep hot tub water bacteria free and safe. It's the sanitizer that prevents mold, algae and other nasty stuff from growing over time either from high usage or when the tub sits stagnant over time. Its job is to kill anything that's introduced to the tub either from the environment or anyone enjoying a soak. As a hot tub owner you may have considered changing sanitizer because of a bad experience or you might have another valid reason to switch. 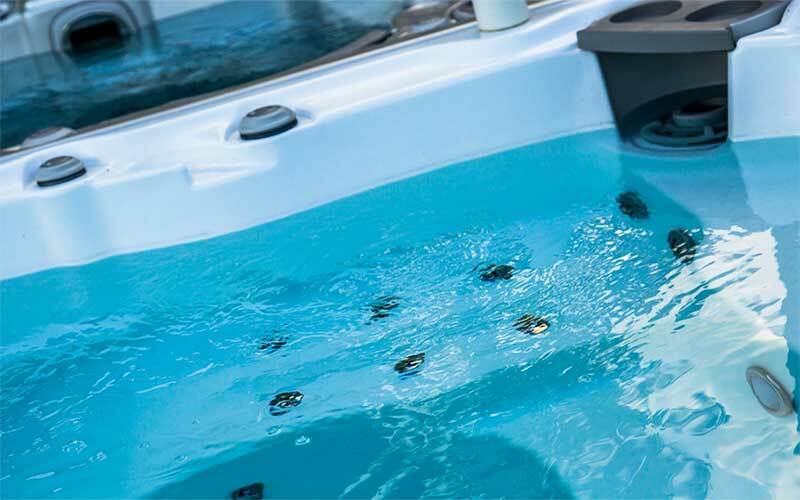 When choosing a hot tub sanitizer there are some distinct advantages and disadvantages that might appeal to some but not others. Chlorine is the most popular form of sanitizer and arguably the most reliable for a number of reasons. If you have a chlorine allergy you are going to choose something else like bromine or maybe even a mineral stick with mild chlorine. We'll go over each form of sanitizer so you can make a decision on the best hot tub sanitizer for you. What is Hot Tub Sanitizer? What is hot tub sanitizer exactly? The simple answer is that sanitizer is the component of hot tub chemistry that kills all the bad stuff. You need a sanitizer otherwise your hot tub would become a soup of bacteria and other living organisms that may be harmful or nasty. We all want to relax in a tub that is crystal clear and of course safe, and without a sanitizer and a maintenance schedule that just can't happen. A hot tub sanitizer system can come in the form of a powder or liquid that's added to the water as needed. It can also consist of a device that converts salt water to chlorine so you don't need to add anything other than salt once or twice a year. We'll take a look at the the different sanitizer methods available. Take a look at the different sanitizer options available and decide for yourself what would be best for you. We'll start with the most common sanitizer, chlorine and finish with the least popular, biguanide. Continue reading below to learn more about alternative hot tub sanitizers. The most widely used and trusted sanitizer around the world is chlorine hands down. It didn't come by this reputation without being incredibly reliable and safe while being affordable. The smell that chlorine can give off is quite distinguishable but a properly balanced hot tub shouldn't smell of chlorine. It's available in liquid, tablet and powder form and is available at just about any hardware store and of course, pool supply stores. A salt water hot tub utilizes the salt in the water to naturally convert salt into low levels of chlorine sanitizer. This natural process eliminates the need to add chemical chlorine and drastically reduces chloramines, the culprit of the strong chlorine odour you smell in some hot tubs. In addition to reducing chemical costs the water is silky soft and excellent for anyone with sensitive skin. Bromine is a clear second choice to chlorine when it comes to hot tub sanitizer because it's odourless and effective in both hot tubs and pools as long as they don't receive direct sunlight. It is even more effective than chlorine at killing bacteria and algae because of its longevity and tolerance to pH fluctuations. The clear downside to bromine is it will burn off if it's exposed to UV rays from the sun and it can't be stabilized like chlorine. A copper based hot tub sanitizer or mineral stick is growing in popularity for it's perceived no chemical and natural sanitizer properties. It uses silver and other minerals to kill bacteria in the water but it reacts very slow. On its own, a mineral based sanitizer may be adequate for your hot tub but we recommend using it in tandem with low levels or chlorine or a weekly shock. The sanitizer biguanide is known as the chlorine-free and bromine-free sanitizer and if you are opposed to chlorine and bromine for whatever reason, this might be the sanitizer choice for you. It's sold in liquid form, odourless and lasts longer than chemical chlorine and bromine. The main disadvantage is it's more expensive than traditional chemicals sanitizers and potentially harmful to your hot tub if it's not used correctly. If you are opposed to chemicals in your hot tub you aren't alone and that is why alternative sanitizers have gained some traction in recent years. If you experience allergic reactions to chlorine or bromine or you just want to try something different there are some other hot tub sanitizer options out there. The following alternatives may take a bit more effort and the complexity goes beyond the scope of this page. Ultraviolet or UV sanitizer utilizes the radiation from high intensity UV bulbs to eliminate germs and bacteria. It is excellent at killing foreign organisms but the main drawback is it you will need a secondary sanitizer to maintain water clarity. It's common to find UV systems working in tandem with either chlorine or bromine either as a one-two punch or intermittent shocks to support the UV system. Using ionizers as a sanitizer is a natural way to kill contaminants and it achieves this by releasing copper and silver ions into the water. It's similar to UV in that it relies on periodic shocks to maintain a completely sanitary environment. Ionizers have a shelf life and will need to be replaces as they expend themselves, based on usage and amount of contaminants in the water. Hydrogen peroxide as a sanitizer is a somewhat experimental way to keep your hot tub sanitized. It definitely falls under the DIY or homemade category because it will take some creativity, patience and some experimenting on your part. This method is beyond the scope of this page but it might be worth looking into if you are into alternative methods of hot tub sanitizer and saving a bit of money at the same time.